On my multiple choice forms I have the question followed by the tick boxes for the answers and a next button. Currently you can progress by pressing next without having selected one of the options. Is there any way that I could force it so that the next button will only work if you have selected one of the responses? I can remove the next button so that the experiment progresses immediately when the response is given however this doesnt seem ideal as it moves very quickly and doesnt allow someone the opportunity to change their mind / check their response before choosing to progress. Also I have two multiple choice forms later in my experiment, after the experimental loop that are not having their responses recorded in the output, even though response times for these variables are appearing in the output. Why would this be? Is there any way that I could force it so that the next button will only work if you have selected one of the responses? It is of note that some of the functions have been improved in the latest versions of OpenSesame (3.0 and higher). Therefore, I attached a new example experiment here. 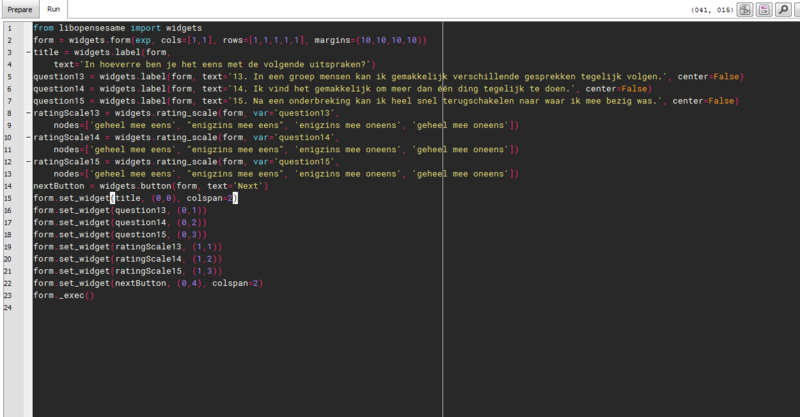 is there any hint to the second question of STOE1_11 regarding the multiple choice forms that do not record the response variable in the output? I just realized that it is the same for my experiment whenever I use the multiple choice item...for all other form items I used the response variables appear in the output. Could you upload your experiment? Then, I can help you quicker. We have the same problem with the multiple choice questions and we want to force it so that you can't go to the next questions without giving an answer. I can not find a clear answer in the other forum. So can anybody helps us with this problem? Here all the checkbox belongs to a same group, so they are associated to a same variable "my_response_var". This variable is initialized with the value "no". So as long as the value of this variable stays no, you can see at the end of this example that the form is executed. When a box is checked, "my_response_var" takes the value of the checkbox, so when next is pressed the trial is over. This looks very nice. I would like to create something similar. I have 28 items, with 3 or 4 items per screen. Each item has a rating scale. My problem is that participants can easily skip one of the items accidentally, because they can just click through, if they haven't filled in all items. Can you help me? I have looked at various pages on this forum, and I mostly wonder if I can make small adjustments to my script, or that I should change it all and use checkboxes instead? I have not worked with checkboxes thus far. Or should I try to use a validator? Yes, validators are definitely a good idea if you want to make sure that all the widgets are being answered. The end of this could be useful to you.